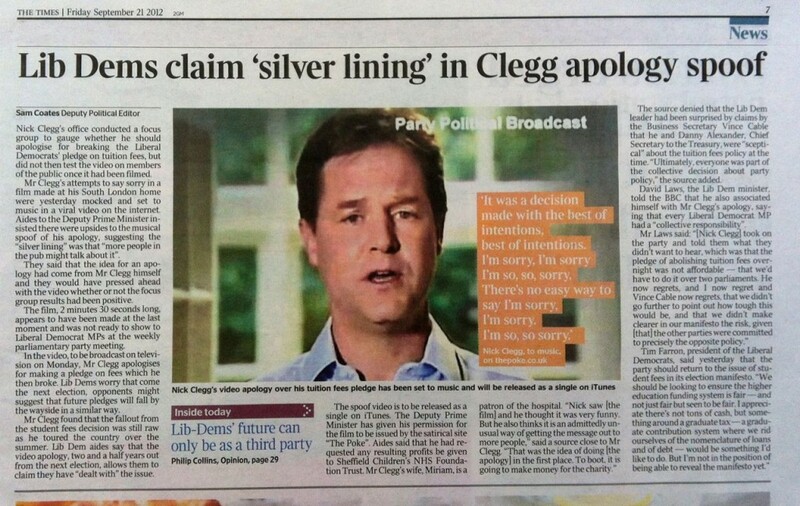 How the media covered the story…. 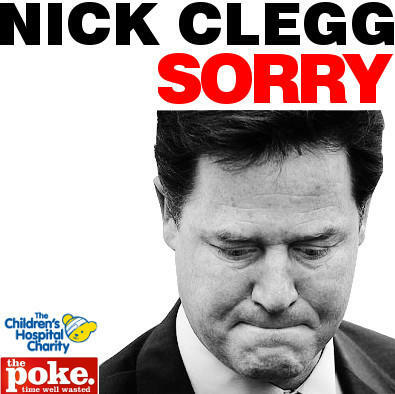 22:00 Thank you all for getting @nick_clegg saying sorry into The Top 40 and raising some much needed dosh for @SheffChildrens. 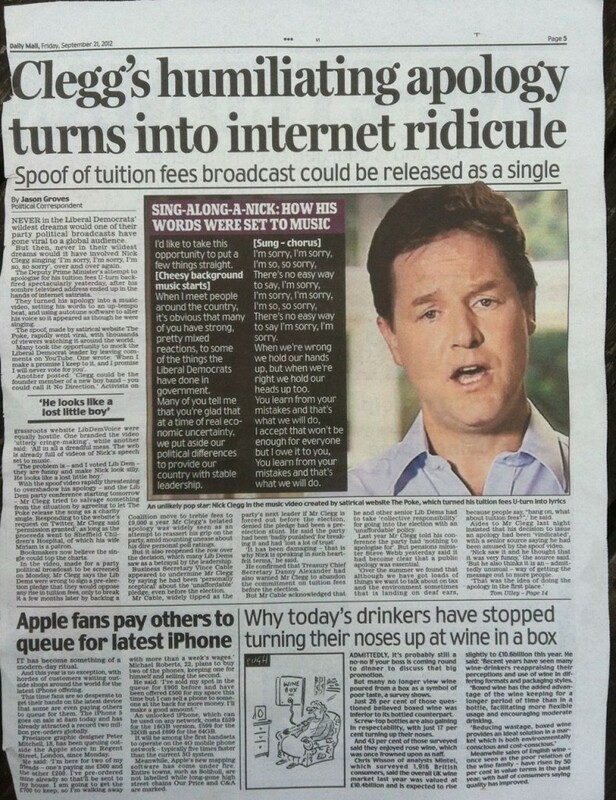 If everyone at the Lib Dem Conference buys it tomorrow they will have a Top 10 hit on their hands. 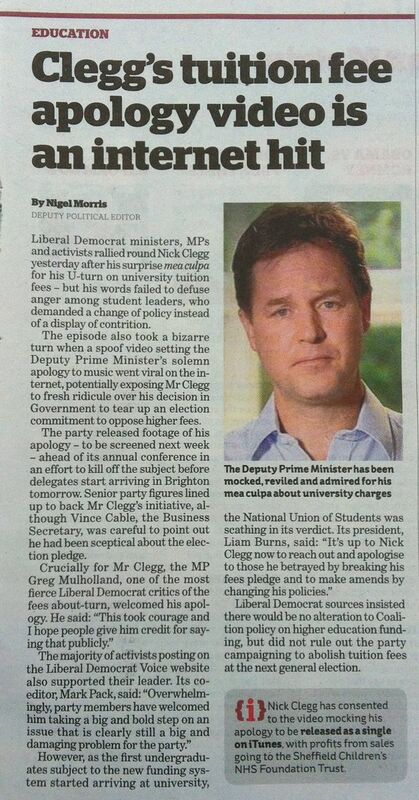 So we’ll now leave it to the @LibDems to make that happen. 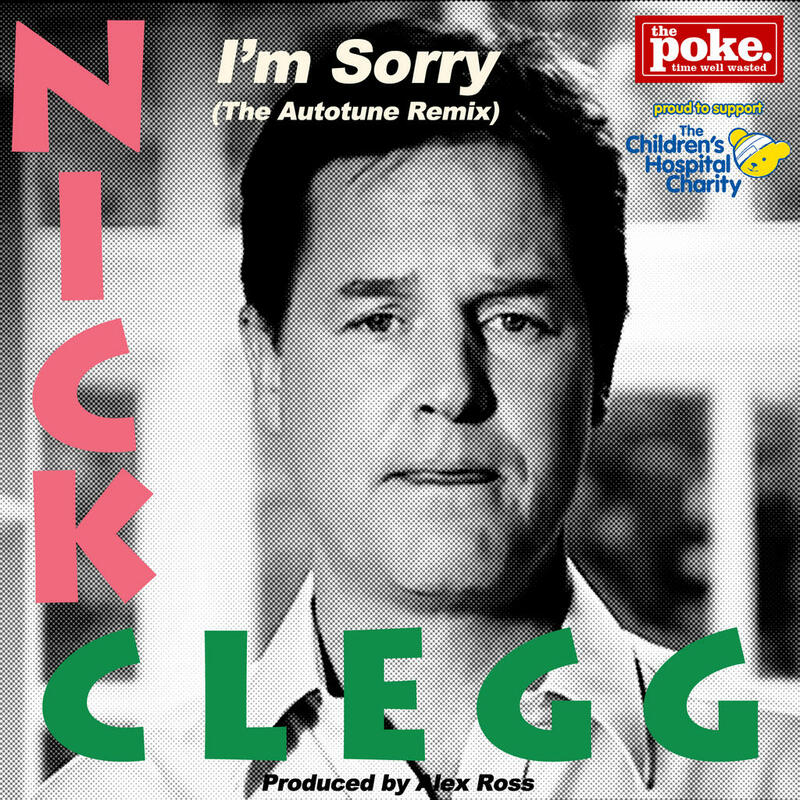 Deputy Prime Minister Nick Clegg is kicking off more than his party conference today– he’s going up against pop big guns David Guetta and Pink as he launches his pop career on iTunes with his debut single ‘Nick Clegg Says I’m Sorry [The Autotune Remix)’. The single, produced by Alex Ross and The Poke, has gone live today on Apple’s iTunes store with other outlets including Amazon going live in the next 24hours. 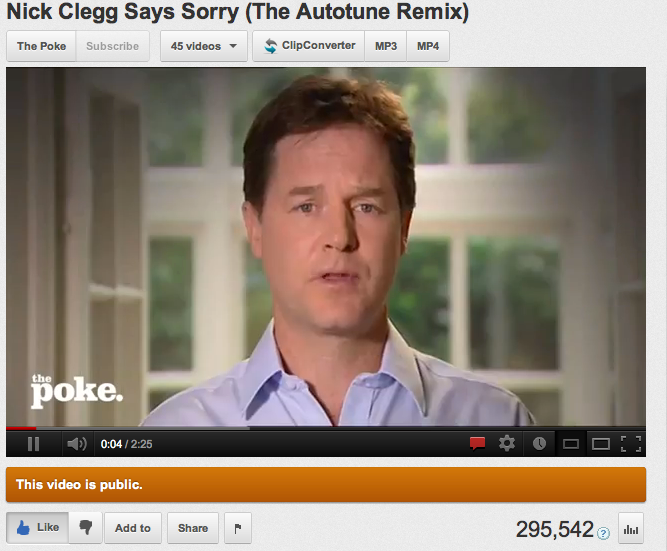 We auto-tuned Nick Clegg’s apologetic tuition fees speech into a video that has had a achieved staggering 500,000 views in just 24 hours. 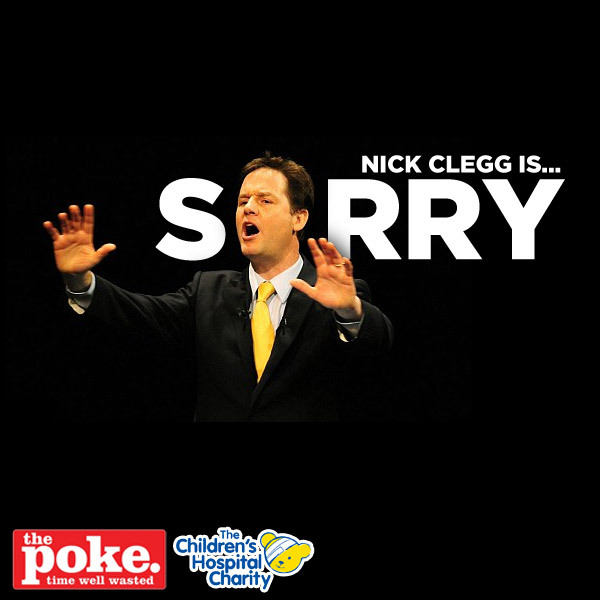 Clegg gave consent for the video to be released as a charity single following a huge response on Twitter. The viral video has already had a frightening amount TV exposure – having been featured on some major TV shows in the last 24 hours including Newsnight, BBC News, The One Show, ITV News, Channel 4 News, Five News, Sky News, News Round and Loose Women. You might have seen Alex’s stuff on here before. 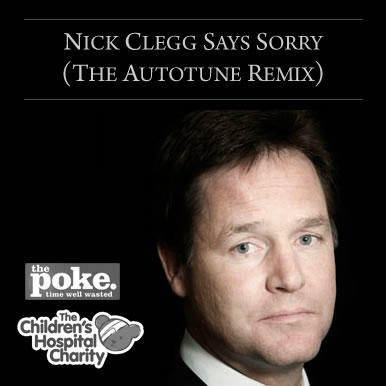 His previous hits include > Leveson The Musical, The Poke autotunes The Apprentice and Downton Abbey Dubstep. 10:00ish Our website crashed under weight of traffic. While we were trying to fix it we wondered if the Lib Dems might give us permission to release it as a single? We weren’t expecting to hear direct from old CLEGGO himself! 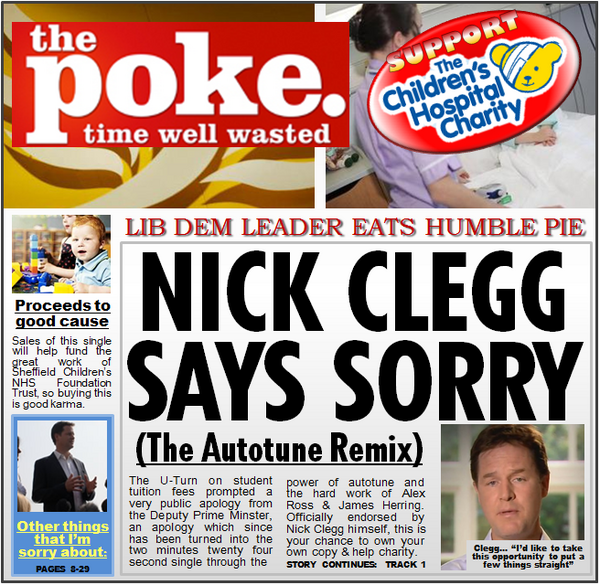 The Week – Nick Clegg sings sorry: could autotune video rescue deputy PM? 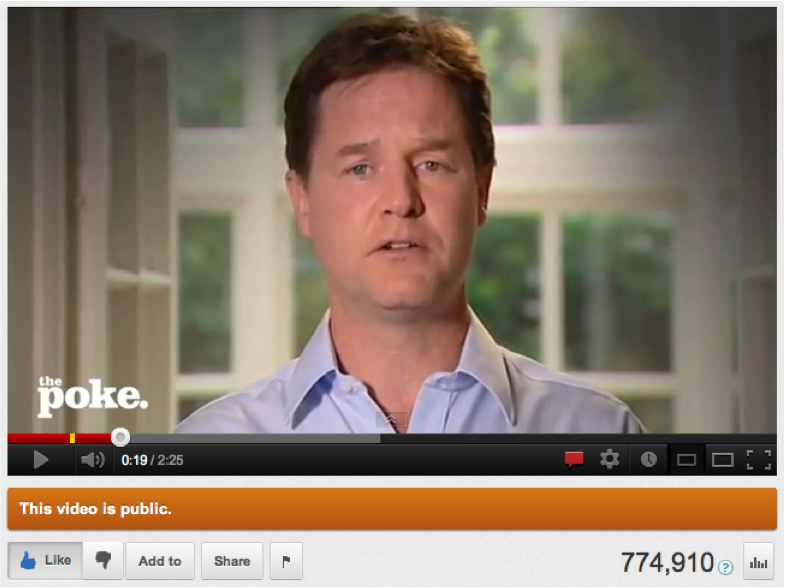 >>> 3pm: Hang on what’s this…we have had some email, we never get email…. 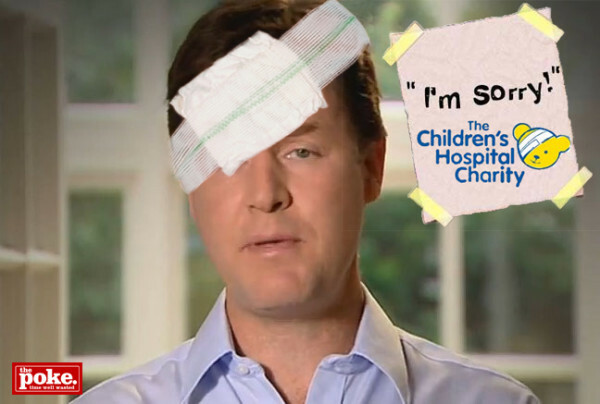 16:42 The bets are on..
6.25pm We’ve just been on the main BBC 6 O’clock news….in total shock…. ………to be continued…story continues from the top of the page..